The good folks at Pink Power are dedicated to easing the burden of handy women by giving them products specifically designed for their frames. Among them is the Pink Power Cordless 18V NiCad Drill Kit, which we’re going to be looking at in detail today. When you buy this compact and cordless power drill, you will also receive a comprehensive drill and driver set, a pink branded carrying case, and 2 NiCad 18V batteries, making this the perfect option for any woman who has only recently decided to get involved in DIY and is lacking any of the necessary tools. Since releasing its Cordless 18V NiCad Drill Kit, Pink Power has also made available a number of booster drill bit sets and more in-depth tool kits, but this product promises everything you’ll need to get started on those repairs and renovations. Obviously, the Pink Power Cordless 18V NiCad Drill Kit was designed with women in mind, but that’s a very broad target market. To be a little more specific, the Pink Power Cordless 18V NiCad Drill Kit is designed for women who have little or no experience in DIY. With its drill kit, which we’ll cover in greater detail in just a moment, it promises virtually everything a DIY novice may need in the early days of their journey. It is important to note, however, that the drill included in this set is suited only to small to medium home improvement jobs and should not be used in professional situations, so tradespeople searching for a new drill should look elsewhere. Although it is relatively inexpensive for a tool set, Pink Power was remarkably generous when packing the Cordless 18V NiCad Drill Kit. 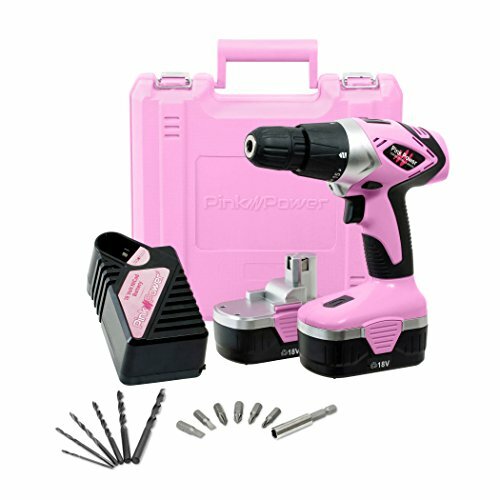 First and foremost, you will receive a pink and black power drill that boasts a total of 17 torque settings and a keyless chuck to hold any bit from the included drill and driver set. You’ll also get two NiCad 18V batteries to power the drill for hours at a time. The free hard storage case that Pink Power throws in with each purchase of this kit will protect the tools from damage, but should problems arise you’ll be able to fall back on Pink Power's 1-year warranty to get a repair or replacement. The drill also comes with an integrated LED light for working in dimly lit areas and a built-in bubble level to ensure accuracy when measuring. The base of the drill is magnetic, which means it can be used to hold screws and nails, allowing you to work with both hands for greater control of the tool. Because the Pink Power Cordless 18V NiCad Drill Kit is intended for DIY novices, you may feel a little intimidated when using your drill for the first time. Never fear! Power drills are easy to get the hang of, regardless of their intended user. In the video below, you will be guided through the process of using a Pink Power drill to make sure you’ll know exactly what you’re doing when the time comes to fire up your new tool. The Pink Power Cordless 18V NiCad Drill Kit generally goes for $60 or so, which is a lot of money to ask from a DIY newbie who isn’t sure if they’re ready to commit to the hobby or not. If you’d rather spend less money on your first power drill, we recommend the WORKSITE 8V Electric Cordless Drill. The WORKSITE 8V Electric Cordless Drill features a lightweight and compact design to make it less wearing on female users and also comes with a 15-piece bit set and a magnetic wristband. The price of this drill will vary from seller to seller, but you should be able to find it for less than $50. The Pink Power Cordless 18V NiCad Drill Kit might be a little too “girly” for some DIYers, but the drill’s performance is nothing less than stellar and the included drill and driver bits serve only to further the kit’s appeal. With its compact design and magnetic base, the drill is among the most convenient in its price range, especially when it comes to long periods of use. If you’re just getting started on your DIY journey, the Pink Power Cordless 18V NiCad Drill Kit will put you on the right track and keep you on it until you reach your destination.